The Nets have now played their second game without Caris LeVert, who instead of the season ending broken foot we all feared, doctors thankfully found no fractures. LeVert suffered a dislocation and will avoid surgery; he is possible for return later this season. With a loss to the Miami Heat Wednesday night they would have to fight to prove that they’re still a good team. Coach Atkinson acknowledges what a great loss LeVert is to their young squad, but he still believes the Nets can succeed without him. “You want to confirm that we can still be a good team. We love Caris, we miss him, but we’ve still got some good players in that locker room.” Said Atkinson Friday night. The Nets would look to show that as they take on the Washington Wizards and try to snap a 3 game losing streak. The Nets were led by Spencer Dinwiddie and D’Angelo Russell, who helped put the Nets up by 2 (56-54) by the end of the first half. Dinwiddie came off the bench and added 16 points, 5 assists, 3 rebounds and 3 steals in the first half; and Russell added 13 points, 2 dimes, and 2 steals of his own. After their halftime regrouping in the locker room, the Nets emerged with much needed aggression. They outscored the Wizards 35-25 in the 3rd quarter, and by the start of the 4th the Wizards never recover. The Nets would defeat Washington 115-104. The Fro is Back!! 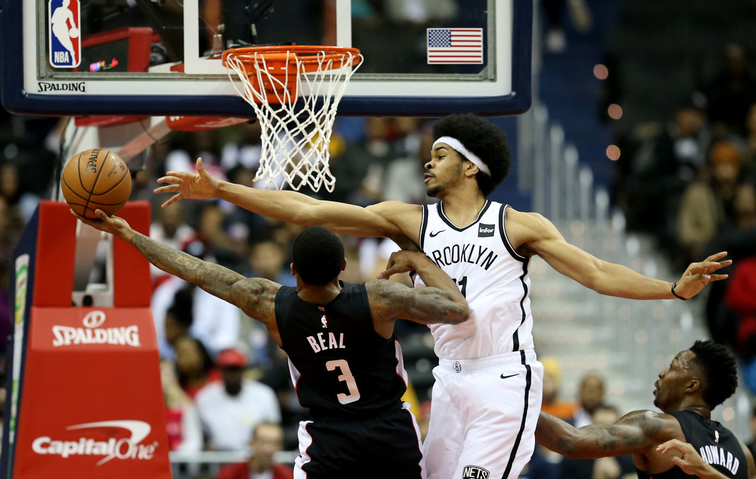 – Jarrett Allen has returned to the starting lineup and in great fashion. He finished with 16 points, grabbed 12 boards, and delivered 2 blocks. Allen continues to show why he’s needed on the floor. His defensive presence was felt and continues to be proven as a team staple. Dinwiddie Season High!! – Off the bench, Spencer Dinwiddie has been electrifying. With LeVert out he constantly makes his offensive ability shine, but he also has key moments on the defensive end as well. Say Hello to Kurucs!! – The Latvian rookie produced his season high as well, finishing with 9 points, and 3 boards of his own. Crabbe’s Struggles Continues!! – Allen Crabbe has still not found his rhythm. He put up 6 points, and 2 rebounds; and averages 9 points so far this season. Lets be honest here, Dinwiddie needs to start in place of Crabbe. He has now turned into a liability. Coach Kenny needs to make that move. Carroll off the Bench!! – DeMarre Carroll finished with 11 points and 6 rebounds. Russell on Fire!! – Remember that “consistency” and “confidence” we said D’Angelo Russell needed to exemplify, well it’s here now. Russell finished with 23 points, and 6 assists as he led the Nets (alongside Dinwiddie) to a much needed victory. Next up Brooklyn returns home as they take on the LA Clippers Saturday evening. They will look to win back to back games.